This book was a much anticipated read because I've long been a "fan" of Jerry Bridges. (Or, as much of a fan that you can be of someone who shakes you up and causes you to reexamine yourself in light of scripture!) So when an opportunity came along to read The Fruitful Life - you can bet I jumped on it! In the introduction to the book, Bridges explains that much of the material in this book is presented in his previous work, The Practice of Godliness. 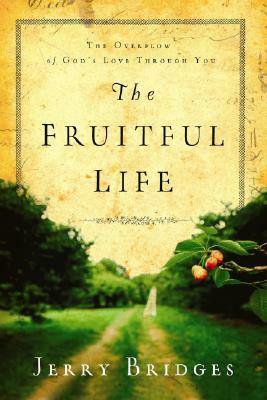 The difference between these two titles is that The Fruitful Life narrows its focus specifically on the "fruits of the Spirit" instead of having them included in a broader discussion of spiritual discipline. Having read The Practice of Godliness years ago, I enjoyed following up with this newer title. And why, as Christians, should we pursue a study of these fruits, seeking to grow in godliness? Bridges sets forth a triangle. The bottom tier represents the fear of God and the Love of God. Combined those grow our devotion to God, building a Desire for God. It is a combination of all of these things that would shape our hearts and our minds to want to be disciplined. The more we concentrate on obedience, the more we will realize how sinful we are and how incapable we are of maintaining godly character/devotion to God without His help. We recognize our sinfulness. We begin to understand His perfection and consistency and our failures. We admire and desire Him more for His perfection and our weaknesses. When you desire God, you seek to follow after Him. You grow in love; you understand His ways. You take on, and exhibit the fruits. With each new nugget of truth you latch onto as you learn more of who God is, you long to know more. Always more. Never less. Never status quo. That admission made, I must say that this book was a good read for me. It challenged me and made me think more deeply about how much I truly desire and long to know God. It convicted me and also gave me hope and inspired me. Bridges has always been able to do that to me through his books, and reading The Fruitful Life was not any different. This is a positive book that I am happy to recommend, probably just to shake you up and deal with any apathetic feelings you might have towards your own sin. I say that only because it made me deal with my own apathetic feelings and that's a good thing. Thanks, Navpress, for offering me the opportunity to take a deeper look inside so that, ultimately, I'd look up and find God to be bigger. I'm also a fan of Bridges. I was part of a women's Bible study years ago that used several of his books to guide our study and discussion. Definitely convicting. But in a good kind of way. Oh, I probably need this one. I've enjoyed several of Jerry Bridges' books, and didn't realize this one had come out. Thanks for the review, Carrie! Somehow I have never read Bridges. This looks like maybe a good one to start with. Would you believe that I went to the same church as Jerry Bridges when I was a kid? My small group read his book Respectable Sins a year or two ago--very challenging and I recommend it!